One of the easiest things you can do to make your home a safe place to live is add ramps to the doorways in an out of your home as well as in-between transitional doorways inside your home. 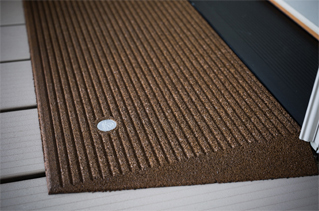 Our modular ramp systems set up in a few hours and are easily removable when no longer needed. Never again will you have to worry about tripping on your doorway between different levels inside your home. Maintain your mobility with our portable wheelchair ramps for your vehicle. They're lightweight and fit in most vehicles.